The stability of The Minutemen as a group continues to unravel as one particular member is driven out. What lies ahead for the fractured team? Writer and artist Darwyn Cooke continues his dark depiction of the early days of The Minutemen with issue three. After reading issue 2 with it's equal share of memorable scenes, I didn't know how Cooke would be able to top the material, he depicted in there. Many revelations were shown involving several of the team members as Cooke descended into some dark waters with the themes he chose for the backstory of The Minutemen. I won't spoil it here but suffice to say, it's quite eye-popping. Could Cooke follow up with more dysfunctional angst involving the team? 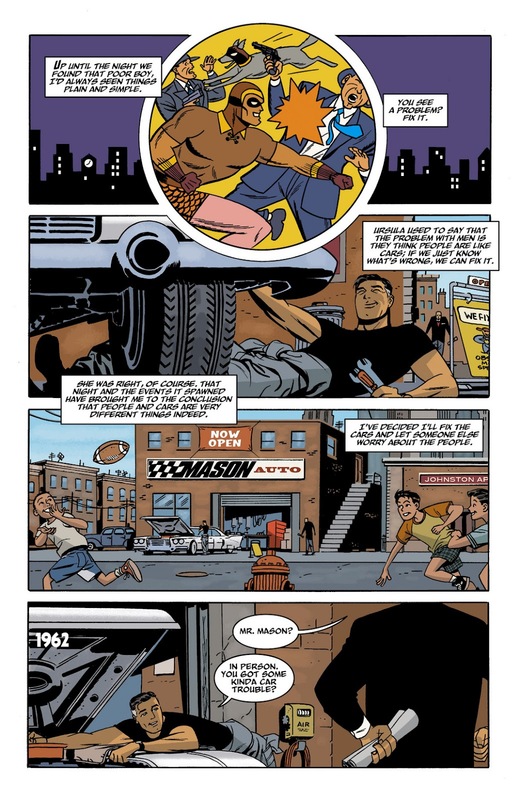 Furthermore, issue 2 showcased the early beginnings of a partnership involving Nite Owl I and The Silhouette, which has been my favorite aspect of Cooke's interpretation of The Minutemen. In my opinion it's a great gesture to The Silhouette who didn't receive much attention in the original Watchmen miniseries. 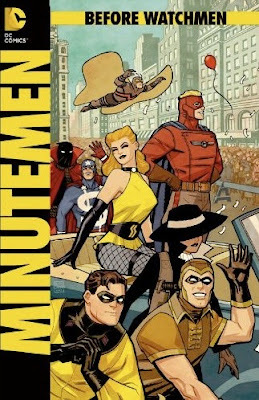 Cooke has had to take a lot of liberties with the limited material on The Minutemen but this part has been an enjoyable detour of the bleakness of the miniseries. Issue 3 picks up from the same fast paced tone established with many recognizable moments that Cooke seams together wonderfully. We see a group on the brink of dissolution, with inner conflict leading to the downfall of the supposed up and coming team. Cooke focuses on Nite Owl I and The Silhouette in a futile adventure, trying their best to do heroic deeds but coming up empty with disastrous outcomes. You can already see which characters Cooke seems to favor for the series as it reaches it's midpoint. However, having seen some solicitations, I think we can expect Cooke to shine the spotlight on other members of the team. There's not much more shocking revelations in this issue but the same sad look at the team breaking apart. Cooke's continued brilliant dialogue and individual characterizations are amazing, perhaps on the spot most of the time, as is his superb artwork.